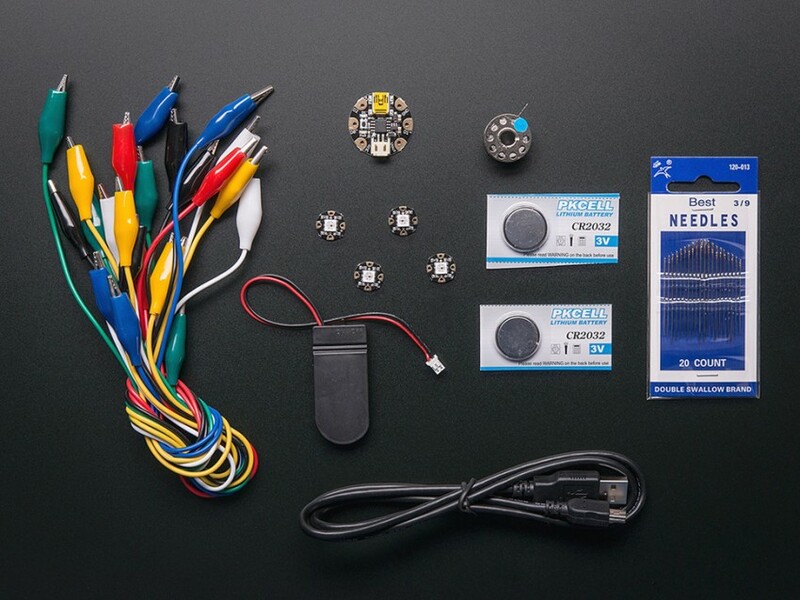 Three Hacked Ugly Sweaters #WearableWednesday « Adafruit Industries – Makers, hackers, artists, designers and engineers! My recent holiday shopping spree uncovered a few stores carrying “Ugly Sweater” kits, which seems crazy since it is so easy to make your own. I decided to take a little tour on Youtube to prove my point and see who is hacking sweaters this year and found three great examples, including an unexpected surprise. The first is by Dave Hunt and is actually called a jumper rather than a sweater as he lives in Ireland. Dave actually demonstrates the making of his sweater later in the video, if you want to tag along. Laser cut acrylic snowflakes are the theme for his jumper with an Arduino Pro Mini and WS2812B RGB LEDs. The way he mounts the LEDs in a circular hub allows the light to stream evenly through each snowflake’s outer arms. He’s using Adafruit’s NeoPixel “Strandtest” code, which offers a few different colorful patterns. Great design, and by looking at the sweater you would think there are a lot more LEDs blinking than there actually are. This second lovely sweater is by computer science and electronics educator, Dawn Dupriest who teaches 8th grade in Colorado. It looks like her class is in for a STEM treat as she has orchestrated music and lights for her Christmas tree masterpiece using a Lilypad Arduino. If you think this is cool, you should see her classroom. Dawn is frequently introducing kids to Arduino, LEDs, piezos and robots. In fact, she asked her students for help picking out a song for her sweater. It just goes to show that you don’t have to wait for the holidays to play with circuits. Every day is maker day! This third sweater is a cozy charmer. Who doesn’t love a fireplace and this one by ThriftDee uses an Iphone for the realistic flame action. I seriously bust out laughing when I realized the trick, and it’s probably a quicker solution than figuring out the flame code for an LED matrix. Of course NeoPixels would rock this, should anyone want to give it a try. Actually any ugly sweater can be made with a GEMMA microcontroller and NeoPixels or LED Sequins. If you are short on time, sequins take shorter time to stitch, but you can always use our silicone wire and just solder anyway. The good thing about sweaters is they often have loose yarn which allows you to easily poke wires through. If you want a one stop shop, our GEMMA Starter Pack has everything you need, so there’s still time to get your ugly together before you visit your parent’s house! Make sure to Tweet us a pic of your family enjoying your sweater.